PALO, Leyte- The Palo National High School, this town, is the latest recipient of the “Handog Computer” program of President Rodrigo Duterte through the Philippine Amusement and Gaming Corporation (Pagcor). 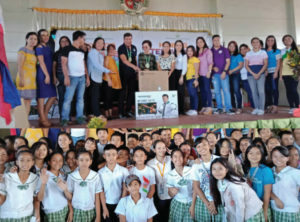 On Friday (December 7), Pagcor, along with Palo Mayor Remedios Petilla, distributed 25 desktop computers and 10 32-inch LED televisions to the school. “This is a big help for you to get an excellent education. Make the most out of these computers and be inspired in your studies,” Petilla told the students. “It’s a blessing. After the 2013 super typhoon Yolanda we received six classrooms from Pagcor, and now they’re back for more assistance to us,” added Estrellita Morano, the school principal. Morano reiterated her gratitude to Petilla, who was also the former Pagcor vice-president during the administration of then President Gloria Macapagal-Arroyo. “It was Mayor Petilla who endorsed the request of our school through the initiative of our two teachers Belen Manasis and Cynthia Agner in 2017,” Morano added. Rico Acuña, Pagcor’s senior community development and welfare officer, urged the school to use the computers and ensure its care for the next batches of students. “We’re thankful to Pagcor. This is a big help to our studies,” said 15-year old student Jasper Buntog. “We promise to take good care of these computers,” Macalalag told the Pagcor official. Considered a “mega-school” in Leyte Division, Palo National High School has 4, 274 students and 144 teachers as of its current school year.